Allison is the largest producer of hybrid bus transmissions in the world and leads the way in all types of hybrid propulsion systems. 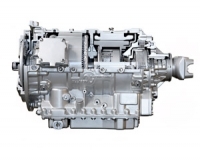 Allison Transmission Hybrid Series incorporates the H 40/50 EP™ hybrid systems. The Hybrid series is suitable for a wide range of medium duty commercial vehicle applications including municipal, transit, utility and distribution. Allison Transmission has been a pioneer in hybrid and electric propulsion systems for over 25 years. Beginning with its collaboration on the General Motors’ electric car Allison has emerged as the global leader in hybrid propulsion and transmissions worldwide. Allison Hybrid Transmissions improve fuel economy, enable faster acceleration, and deliver enhanced reliability and durability. The Allison H 40/50 EP™ hybrid systems have been in full production since 2003 and operate in thousands of buses worldwide offering up to 25% fuel savings depending on the application and duty cycle. The Allison H 3000 hybrid transmission is designed for medium-duty trucks. and combines the best of Allison Hybrid technology with Continuous Power Technology™.